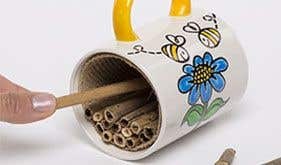 Great Classroom and home activity for kids to get them interested in Bee conservation. Sketch your design on the ceramic mug using a pencil. Outline your design using a Black Porcelain Outline Pen. Leave to dry. 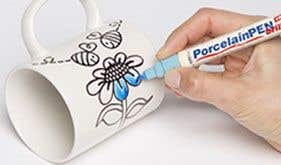 Colour and decorate the outside of the mug using Porcelain paint pens. Leave to dry. As directed on the porcelain pen, heat fix your design in a non-heated oven for 90 minutes at 160 degrees centigrade. Then to help protect your design from the elements, use a coat of Acrylic Satin Varnish. Using scissors cut a rectangle piece of hessian or warm fabric 8cm x 21cm and place inside the mug to act as a lining. To prevent the lining from slipping, you could add some glue so the lining adheres to the side of the mug. 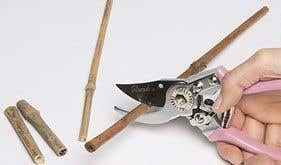 Using the secateurs, cut 45-50 pieces of bamboo 8cm long. Lay the ceramic mug on its side and insert the bamboo sticks one by one onto the fabric lining until nearly full. Then stand the mug upright and insert the last of the bamboo sticks. The bamboo sticks should fit snugly and should not move. Ideally, the bamboo sticks should not be flush with the lip of the mug, but slightly inside, to help protect them from rain. 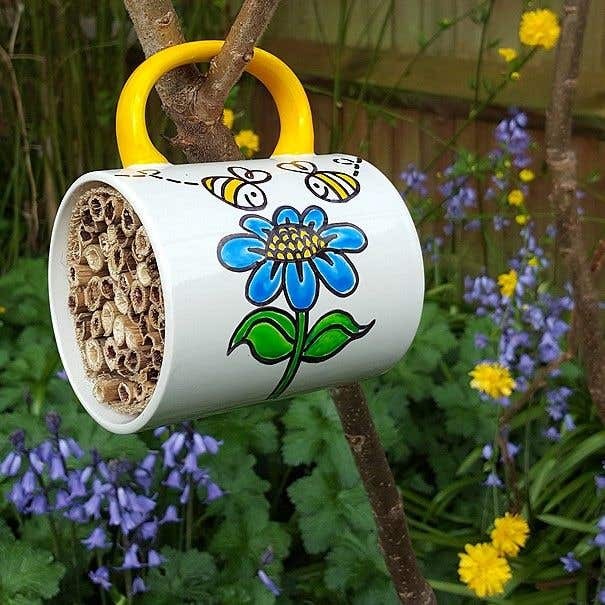 Wrap wire around the mug handle and hang up your Ceramic Bee Hotel in a sheltered but sunny south facing position on a tree, fence, wall or post at least a metre off the ground, with no vegetation blocking the entrance. Decorate your ceramic mug as brightly as possible. Use lots of blue and yellow as bees are especially attracted to these colours.